I par­tic­i­pated in an Ambas­sador Pro­gram on behalf of Mom Cen­tral Con­sult­ing for Brother P-touch. I received a prod­uct sam­ple to facil­i­tate my review and pro­mo­tional item as a thank you for participating. I recently introduced you too my new, handy orga­ni­za­tional tool — the Brother P-touch PT-H100 label maker. It’s use­ful for all kinds of dif­fer­ent projects. We used it to help with some of the garage orga­ni­za­tion that we’ve been work­ing on. 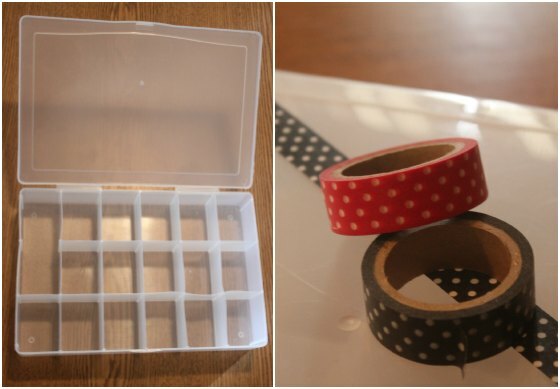 And last month, I used it to make some simple holiday food containers! With the busyness of the holidays behind us and the new year upon us, I’ve been tackling more organizational projects around the house lately. And, I finally tackled a project that I’ve been meaning to do for a while now – a jewelry organizer spruced up with some wash tape! Those that know me well know that I actually don’t wear much jewelry (or have much either). What I do wear tends to be rather small & simple. 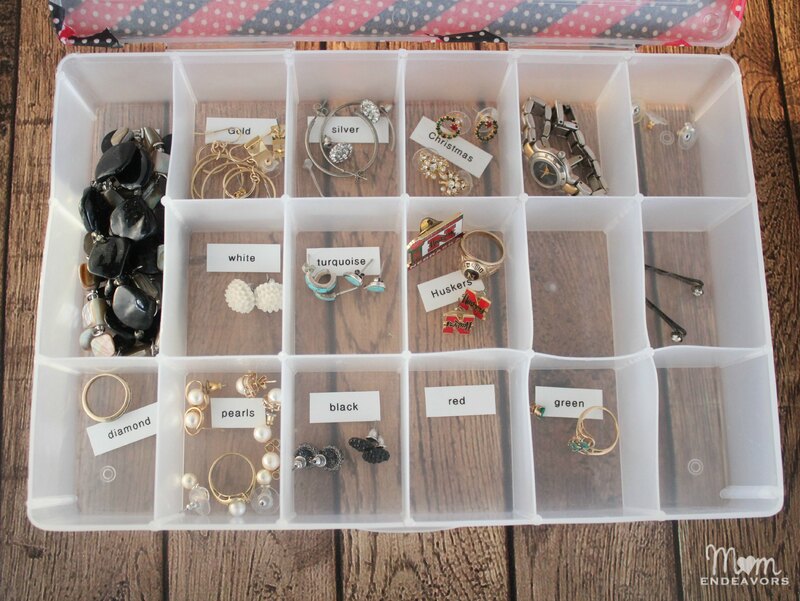 I LOVE some of the earring organizers I’ve seen on Pinterest, but I own almost no dangling or hoop-earrings. Weird, I know. But, with the exception of just 1 or 2 pairs, everything I own are studs. I’ve had a plastic embroidery floss container just sitting around waiting to be used. But I wanted to spruce it up a bit! 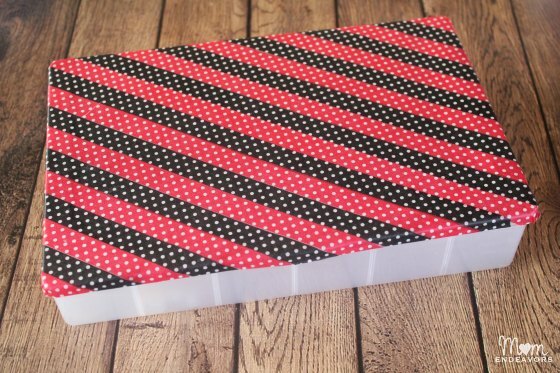 So, I used some polka dot washi tape in my favorite colors (red & black) to embellish the lid. 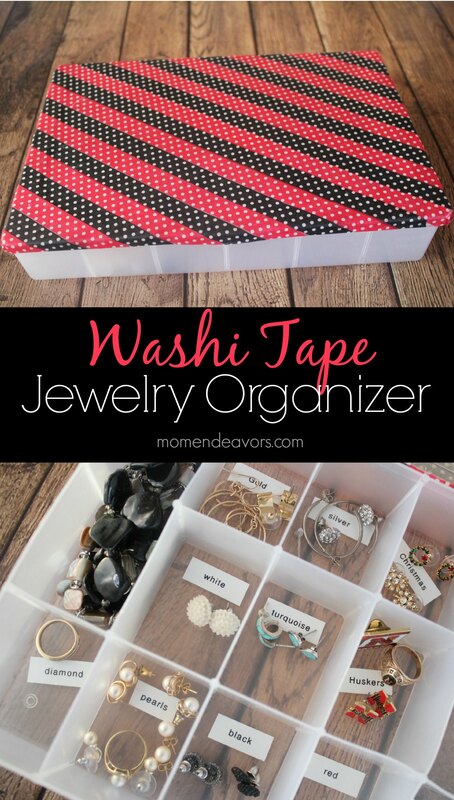 But, you can use any style & colors of washi that you like! If you’re worried about the tape coming up, you could go over it with a thin layer of Mod Podge. Then, I tackled the inside with my Brother P- Touch label maker. I sorted my jewelry into some various categories (code by colors/type/etc) and made a label for each section. Super easy! I wish I would have done this ages ago! Before, all my smaller jewelry (earrings, rings, etc) was just in some open bowl/box containers. It was not always easy to find things or to see if something was missing (I may not be the best with always putting things back). So, I’m loving that everything is organized by category & labeled. This was an easy project with great results! Everything has its place and is so much easier to see. I even have room for jewelry (like I said, I don’t have a lot! 😉 ). 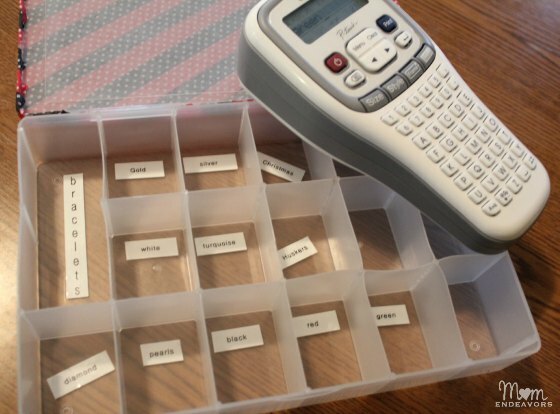 I love how easy projects like this are with the label maker! If you don’t have you’re own, now is a great time to buy as the Brother P-touch has been hav­ing some spe­cial pro­mo­tions and deals at select retail loca­tions & office sup­ply stores to cel­e­brate their 25th Anniversary!